They came to be known as “The Boys”, even though about 80 of them were girls, and formed a tight-knit group. They are the subject of a book The Boys by historian Martin Gilbert. For the past year, each survivor, or their relatives, have been attending workshops to create a fabric square which has been sewn into a giant quilt to help keep their stories alive for generations to come. Measuring a huge 756 square metres and made of 168 individual pieces, the quilt project is a celebration of survival in the face of adversity. Behind each beautiful square is a story not only of remarkable survival but also one of the most horrific massacres known to mankind. My grandfather, David Herman, who lived in Hampstead Garden Suburb, died in 2008 and we have created a square for him. He was 12 when the war started and his hometown of Munkacs came under the rule of Nazis. David and his family moved to the Jewish ghetto, and three years later, they were herded onto a train to Auschwitz. On arrival at the infamous death camp, they were met by SS officers who beat them brutally with sticks. David was separated from his family as his mother was led to one side. He never saw her again. My grandfather lied about his age so many times during his lifetime that, when he died seven years ago, not even he could remember how old he was. It was one of those lies that saved his life. In Auschwitz, women, the young, the elderly and the infirm were sent straight to the gas chambers. At the age of 16 David would have been too young to work. By saying he was 18, and that he had a trade, he was judged useful enough to live. From Auschwitz, David was transferred to five more concentration camps. In one, Rhemsdorf, he was miraculously reunited with his younger brother, Abe, who had also survived Auschwitz. They managed to keep each other alive during their imprisonment, and on the bitter and painfully long death march to Theresienstadt. Here they were eventually liberated by the Russians in 1945. David was suffering from typhus and weighed four-and-a-half stone. After the war the British government agreed to receive up to 1,000 orphaned Jewish child survivors. But of the 1.5 million children who suffered at the hands of the Nazis only 732 could be found to move to the UK as part of this initiative. My grandfather was one of them. Despite the hands they were dealt, The Boys thrived in the UK. Many went on to have large families and build successful businesses. My mother, Rosalind Gelbart, and aunt, Julia Burton, are part of the Second Generation, a group of children of Holocaust survivors. They are among the leaders of the quilt project. Julia said: “I have been overwhelmed by the response to this project and the amount of effort and emotion that has gone into making every single square. I know for many of the Second Generation, they found it quite a catharsis. Rosalind added: “I think it’s a very moving tribute to some very amazing individuals. Everyone has a wonderful story and somehow the families have managed to capture the personal stories of this unique group of people. We hope the quilt will now start its journey to museums around the world. My grandfather’s story is one of many, but now the numbers of those who can tell the stories first-hand is dwindling. 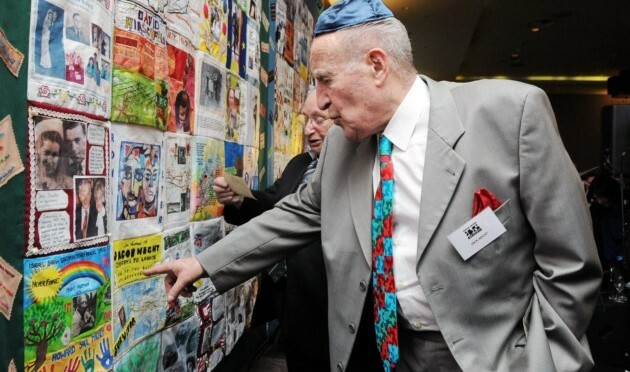 The memory quilt will keep the stories alive for generations to come and gives us, the children and grandchildren of The Boys, another great story to tell.